Helen Monsch (1881 - 1959) began her life-long career as researcher and teacher long before she came to Cornell University in the summer of 1918. Helen spent her early years in Louisville, Kentucky, where she attended the State Normal School. In 1904, she received her B.S. in Home Economics from the Kansas Agricultural College. Five years later, she received her B.S. in Chemistry from the University of Chicago. Monsch went on to receive her M.S. in 1916 from Teachers College, Columbia University. Both during and after her schooling, Monsch headed various food and nutrition programs. 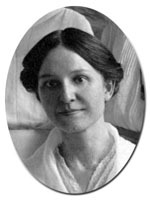 Between 1907 and 1918, she worked at Simmons College, public high schools in the Midwest, and Iowa State College. She researched and developed standards in child and infant feeding and nutrition at the Iowa University Children's Hospital, Iowa Welfare Research Station, Rush Medical College, and Illinois College of Medicine. Monsch's experience in nutritional sciences and her friendship with Flora Rose, co-director of the Home Economics Department, made her a prime candidate for employment in Cornell's summer home economics extension programs. Monsch quickly became one of the most respected and well-liked professors in the department. Her amiable personality and rigorous research contributed to her growing popularity among home economics students and staff. In 1925, she was promoted to head of the Food and Nutrition Department, a position she held until her retirement in 1947. At Cornell, Monsch continued her research as supervisor of the children's nutrition program for the laboratory (nursery) school. She taught nutrition courses dealing with the nutritional needs of pregnant and nursing women and infants. Monsch co-authored a book, Feeding Babies and Mothers of Babies, with her former student Marguerite Harper. In addition, she directed the film "For Health and Happiness" to further inform the public about the importance of scientific nutrition. Monsch continued her work with the extension program, and during World War I developed information on the preparation of low cost diets for large families. At the age of 67, Helen Monsch retired from Cornell, but maintained an active life in emerita status. Monsch donated over 300 volumes to the home economics library, was a panelist at a New England Health Institute on Child Development, and undertook the revision of her book. Helen Monsch died at the age of 78. Like many collegiate home economists of her time, Monsch remained unmarried her entire life; teaching and learning always took center stage.